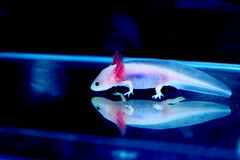 I know the Axolotl has been posted here before but as of Nov 7th the Axolotl has been put on the IUCNs critically endangered list. My post concludes with the contact info of the IUCN Amphibian Conservation Officer. Their numbers have decreased over 60% in the last 10 years and I'm trying to drum up support for their sanctuary effort. 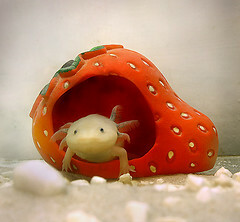 In the canals beneath Mexico City and in the lake that surrounds it lives the Axolotl or "Water Monster." It is an ancient race of up to 2 ft long salamander that Aztecs say are the direct descendent's of Xototl, the dog headed god of Death. I think they look more like pokemon with their cartoonish eyes and mouths and anime style external gills. In 1998 the waters of Lake Xochimilco held 1500 axolotl per square mile, when surveyed this year it was a mere 25 per square mile. Scientists are now saying this otherworldly creature may only have five years left on the planet before it succumbs to extinction.